more for the flavors imparted by the smoke during the cooking process then the actual preservation of the food. 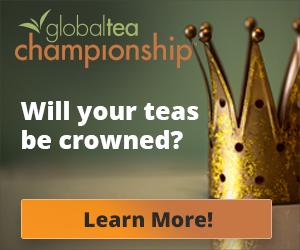 Smoking with tea leaves is one of the earliest examples of historic tea cuisine. 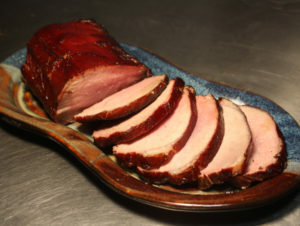 The iconic Tea Smoked Duck is still enjoyed today, often using the same classic techniques developed generations ago. Click here for recipes on how to smoke pork, salmon, and quail. Sometimes in fact, the smoke is used only for flavor transformation, such as in tea smoked salt or cheese, or even smoked cocktails, and no cooking of the product is desired at all. Smoking with tea leaves is not that different from classic wood chip smoking, and in fact tea leaves and wood chips work beautifully together. 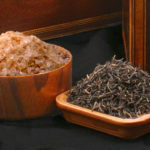 More often than not, blended in with the tea leaves, will be, if not wood chips, other aromatic flavor components such as spices, nut shells or zest as well as uncooked rice to moderate the burn-off of the leaves, and sugar to aid the smoke in penetrating and sticking to the item being smoked. 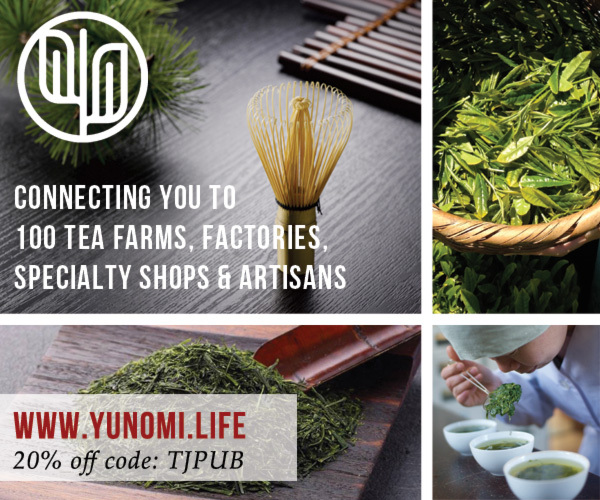 Larger leaf aromatic teas such as Keemun, Yunnan, Nilgiri, lychee and jasmine, work very well for smoking and you will select the best tea as well as the other aromatics according to the food being smoked. There are a variety of approaches to smoking with tea leaves such as using a commercial smoker, an outdoor gas grill with or without a smoker box, an outdoor charcoal grill, an indoor stovetop wok, hotel pan or commercial ‘smoking pan’ or even a hand held smoker like the commercial ‘Smoking Gun’ or a vaporizer. For each of these techniques, other than the smoking gun which is used solely for the flavor and aromatics, you have the option of cooking the product in parallel with smoking it. The example we’re using with the ‘Smoking Gun’ is a smoked cocktail, which belies the usual smoking rule to pat dry your product well before smoking it as a dried product will smoke more evenly and effectively. Since the amount of time needed to cook most products through could potentially over-smoke the dish, it is common to combine smoking with additional cooking. 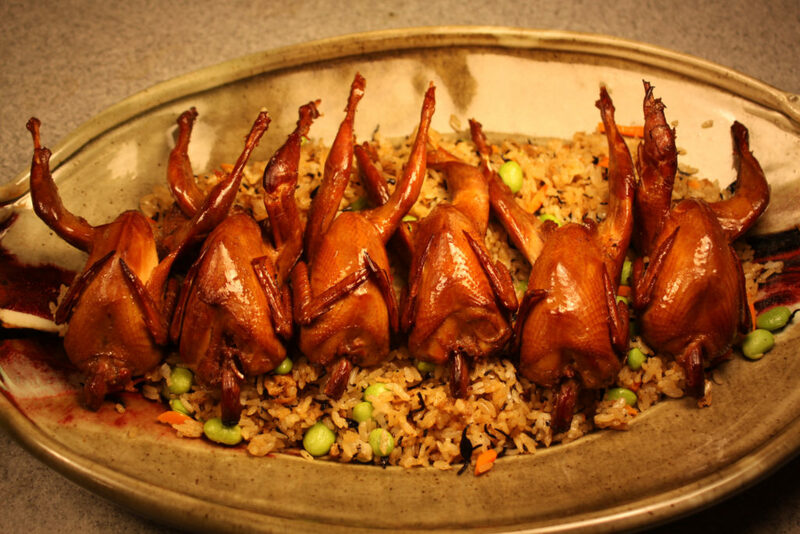 In general, in Chinese cuisine, the items are cooked or partially cooked beforehand (steaming or boiling), while in Western smoking recipes it is often more common to finish cooking the item after the desired amount of smoking has been reached in an oven or on a grill. If of course the reverse is the case, and you want only a touch of smoke, you can add the smoking packet near the end, or remove it when the proper amount of smoking is achieved. Color can be your indicator here and when a beautiful burnished amber hue is achieved, feel free to remove the smoking packet and continue to cook/grill your item. Keep in mind with any smoking technique, when possible, place the product to be smoked away from the smoking packet or pile, and always leave adequate room between and around items to be smoked to allow proper air circulation and even smoking. 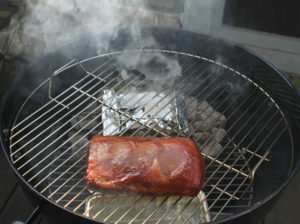 Pork takes particularly well to smoking techniques, especially those that are preceded by brining. Tea will enhance both of these stages in the preparation. This recipe demonstrates smoking on a covered outdoor charcoal grill, but alternate smoking techniques may be used with excellent results. I enjoy using Tea Smoked Salts as finishing salts where a pinch can really bring together the flavor and aromatic components of your dish. They also work beautifully to rim a wide range of cocktails. Use a good quality large crystal salt as your base. The larger the crystal size, the easier it is to smoke quickly and efficiently. Small size crystals will compact in the smoking tray allowing only the very top layer to be smoked. If you prefer smaller crystals, then you will want to partially smoke your salt, stir it well, smoke again, and repeat as needed. Smoked poultry or fish are seen often in Asian cuisines, while in the west, particularly America, meat is more often smoked. Here we are smoking quail, which would typically in Asian smoking recipes, be par-cooked before being smoked. I have chosen to instead follow a more western approach and finish the cooking, if needed in an oven or on a grill afterwards. I enjoy the level of control that this allows as well as a last ability to crisp up the quail skin. Either approach can give excellent results. Quail smoked in tea leaves. Photo by Julian Landa. Jasmine Tea cured salmon was one of the first Culinary Tea recipes I ever made roughly 20 years ago, and I still regularly turn to it. 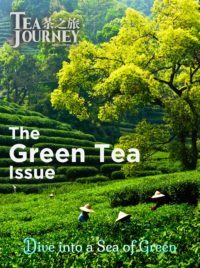 Although I’ve varied the tea and secondary ingredients used, I still often return to Jasmine as seen in November 2016 in Tea Journey. Smoking is of course a classic way to preserve and flavor Salmon and has been utilized for generations in various cultures around the world. 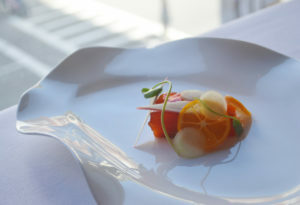 Chef de Cuisine Logan Foos of L’Espalier has enhanced the basic tea cured salmon (gravlax) by combining these two favorite approaches for an incredibly aromatic and succulent first course. Click here for the recipe. You might also like Jasmine Cured Salmon. Click here for the recipe. Tea smoke can enhance endless different foods, but why not beverages? 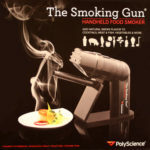 I’ve often used Lapsang Souchong to add a smoky element to cocktails, but with the advent of a wonderful toy, The Smoking Gun from PolyScience, it has become fun and easy to smoke items that were previously quite a challenge! I have to admit, as someone who periodically enjoys a good murder mystery, I love the name almost as much as the piece of equipment. The Smoking Gun is more affordable (under $100) than some of its alternatives, and incredibly easy for light duty usage. 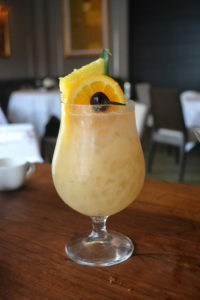 Tiki cocktails are typically rum based, fruity, and by definition, showy. William Prine, a senior service Captain at L’Espalier, located at the Mandarin Oriental in Boston, has created this fabulous drink. It’s quite enjoyable as a straight tiki style cocktail, but the Keemun and clove smoke really bring it to life. The Xocolat Bitters tease out the cocoa undertones of the Keemun tea and give a memorable finish to this cocktail.